The Avalon stage will be rockin’ on May 29, but not with musicians or drums or electric guitars. 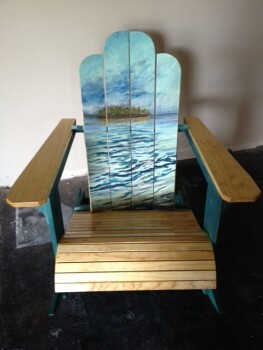 Local art will take the stage and will blow you away as originality, functionality and charm mingle passionately in Talbot Humane’s second annual “chairity” auction. 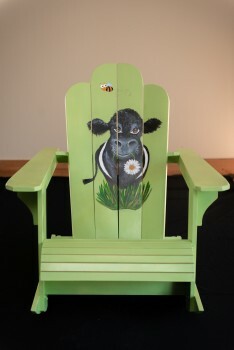 Rock On Talbot Humane will feature 20 one-of-a-kind, hand painted chairs for live auction to benefit the shelter animals at Talbot Humane. The event is free and open to the public, and it will include an uncommon and exceptional silent auction, delicious food, cash bar, and of course, the Avalon milieu. 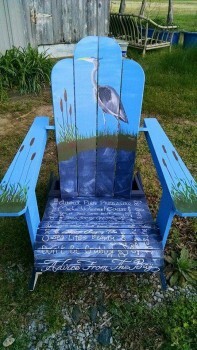 This year, Rock On Talbot Humane will auction 15 custom-built, rocking Adirondack chairs, five children’s Adirondack chairs, and a signature bench. 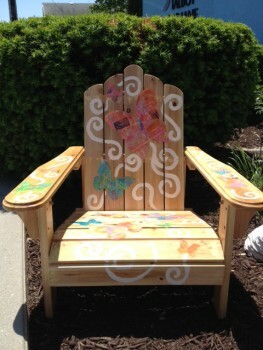 Each is sponsored by a local business, where it remains on display for the public to enjoy until they are auctioned in May. 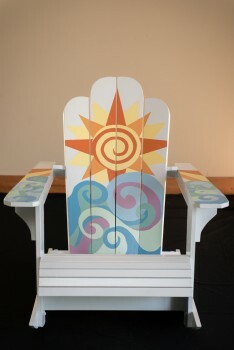 Chairs will start appearing at local businesses at the end of April. 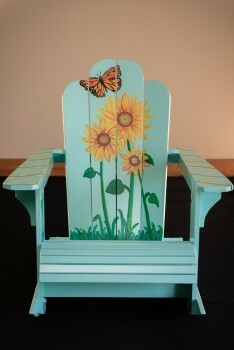 Photos of the painted chairs also will start popping up in the coming weeks on Talbot Humane’s Facebook page, the Rock On Talbot Humane Facebook page, and Talbot Humane’s website at www.talbothumane.org. 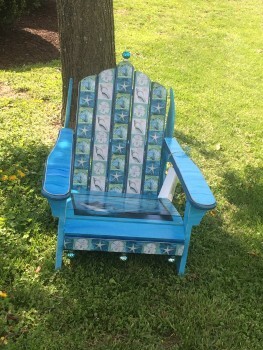 “Last year, we raised just over $17,000 for the shelter through our live and silent auctions, and of course, we hope to surpass that at this year’s event,” said Langfitt. 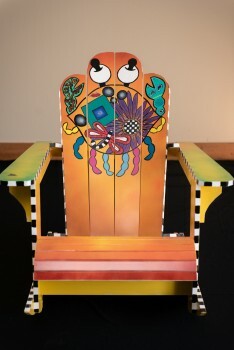 “It’s a wonderful way for the public to support the work we do here at Talbot Humane and take home a beautiful piece of artwork they will use and enjoy for years to come.” From the original design of the rocking Adirondack chair, hand-built in Maryland, to the custom art work, Rock On Talbot Humane chairs are worth the investment buyers put both into the chairs and into caring for our community’s homeless animals. 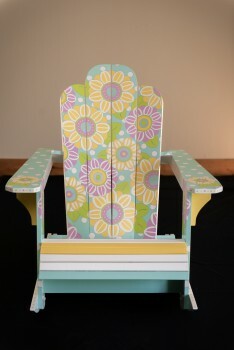 Chairs ranged in price last year from $300 to $2,000. 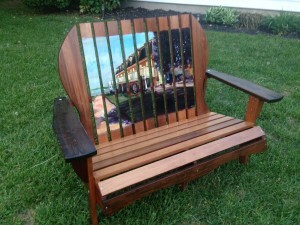 This year’s project features a signature bench, which is displayed at The Academy of Arts in Easton. 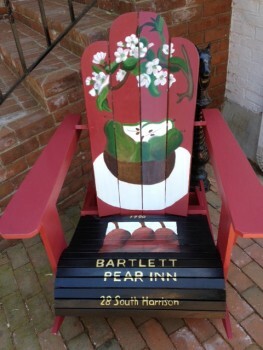 Painted by local artist Jonathan Crist, who often combines stain and paint to create iconic Eastern Shore scenes, this year, The Robert Morris Inn is his muse. 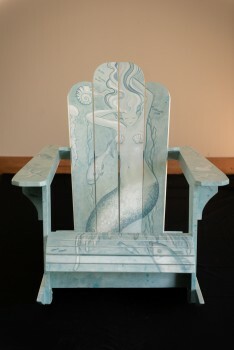 A fun addition to this year’s auction, conducted by Buddy Foxwell of Foxwell Auctions in Cambridge, are children’s Adirondacks, which will bring a fun new element to the night, and are include a sports chair and a mermaid theme. 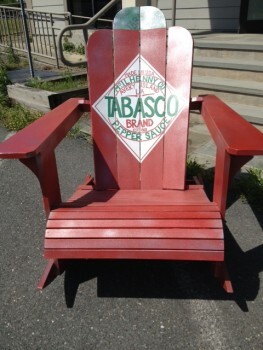 We are certain the “Bidder’s Choice” chair will also be popular. 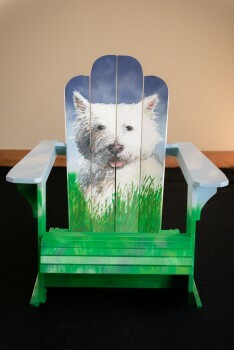 Famed pet portrait Artist Nancy Norman VanSchaik will be creating a chair of the bidder’s choosing! 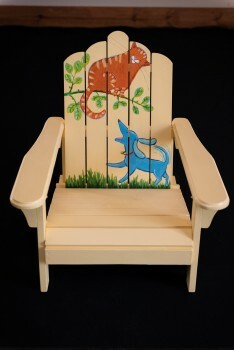 Imagine your furred love immortalized on a one-of-a-kind rocking Adirondack! 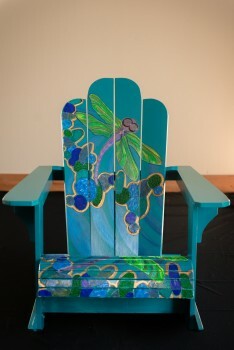 Doors will open at the Avalon at 6:30 pm and the live auction starts at 7 pm on May 29. For more information on the Rock On Talbot Humane project, contact Susan Langfitt at 410-822-0107 or susan@talbothumane.org. UNLEASHED is Taking on 2015! Can you even believe 2015 is almost here? Well, Talbot Humane’s Charity Running Program UNLEASHED will be running into the new year with hopes of changing more lives- human and animal! UNLEASHED is a 6-month physical conditioning program geared at both beginners and experienced runners. More than 100,000 marathoners have used the training method that Unleashed is based on, with 98% success! The training combines running with regular walk breaks to help you build endurance. You will start out with a slow 3-mile run and gradually increase your distance each Saturday during group runs. Each week you will see your progress and really appreciate how far you’ve come! Generally, new runners start out with half marathon training. Returning runners often opt to train for a full marathon! Often it isn’t the idea of running that deters potential team members, it is the fundraising aspect. One of our biggest doubters last year, who stressed that she was not going to raise her $500 goal actually turned out to be our biggest fundraiser of the season! 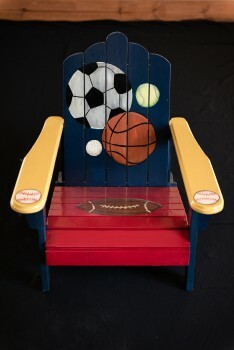 We will guide you through your fundraising and make it fun and easy to reach all of your goals- physical and financial! For more information on UNLEASHED and the perks you gain from joining our team, visit us HERE. Pawsitively Fabulous Boutique Opens Again! Talbot Humane is thrilled to be partnering once again with Lacaze Meredith Realty at 17 N. Harrison St. to open our Pawsitively Fabulous Boutique in downtown Easton. The shop will be open Friday- Sunday beginning on Waterfowl Weekend and will open every weekend through December 21nd. 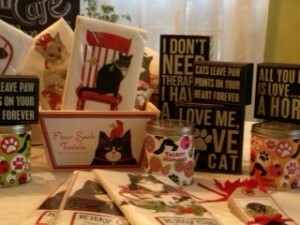 The boutique is filled with fresh ideas and gifts for everyone, not only animal lovers. Even if you are not a pet owner, you will want to visit our shop for gifts and goodies for yourself, friends and loved ones. 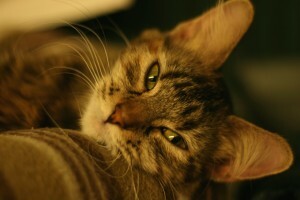 Candles, clothing, home decor, pet toys and more will be filling the shop, all to benefit the animals of Talbot Humane. Volunteers will be greeting shoppers Fridays and Saturdays 10AM-4PM and Sundays noon-4PM through December 21nd. Once you’ve visited our boutique we hope you support the other downtown businesses as the too give back to the community in so many ways. Bark Week is going to make you chase your tail with excitement! You know us, we cannot contain the fun to just one day! 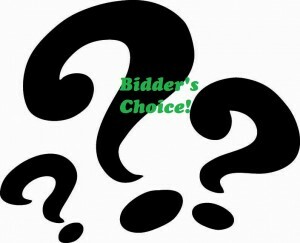 Start with our Facebook trivia contest. Each day sometime between 9A-noon we will post a trivia question about Talbot Humane, animals, pet care or Bark in the Park. The first correct answer each day will win a Bark in the Park related prize ranging from event registration to BITP T-shirts and more! On Tuesday October 14th tune to Bark in the Park sponsor WCEI 96.7 during the 8 o’clock hour. Matt & Mo will be chatting with Patty Quimby & Susan Langfitt about Talbot Humane and Bark in the Park! Then, on Friday October 17th tune into Delmarvalife on WBOC Channel 16 at 5PM to see our adoptable pets (some will be dressed ready for the costume parade!) and last minute updates on Saturday’s event. As the sponsor for the Bark in the Park Guinness World Record Costume Parade the Hair O’ The Dog Gang is jumping right in to make Bark Week FUN and FABULOUS for everyone! October 12-17 they will be making sure you don’t forget about Bark in the Park! 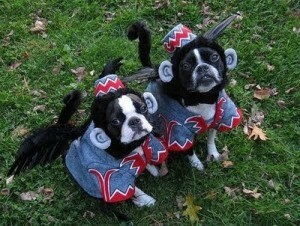 Here is a reason to get that costume ready now! “The Dog” will be holding a Dog Costume Contest throughout the week. 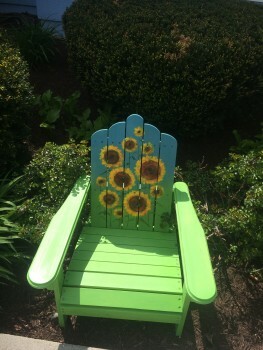 Go to Hair O’ the Dog on Marlboro Rd. 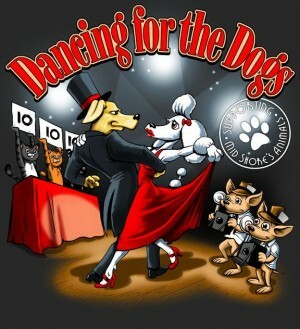 in Easton with your dog dressed to impress and they will take photos to post to the HOTD Facebook page. 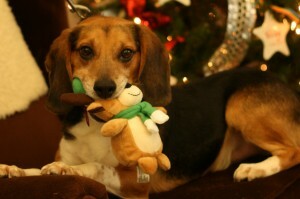 The dog with the most likes will win a $50 gift card to HOTD, 2nd place a $25 gift card and 3rd place a $10 gift card! Friday will also have a wine tasting featuring a Chardonnay & Cabernet Sauvignon from Frenchie Winery. Frenchie donates $1.00 for every bottle sold to the national ASPCA. They also have French Bulldogs on the labels and are geared towards dog lovers! 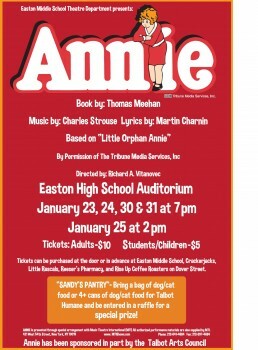 We wish to send great thanks to our major event sponsors: Hair O’ The Dog, Koons of Easton, Easton Utilities, WCEI Radio, Bay Imprint, and The Star Democrat. 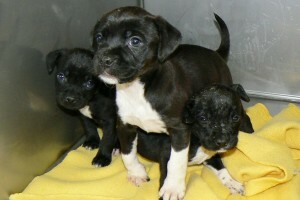 We hope you choose to support Talbot Humane in our biggest fundraiser of the year. We know you are busy. We know you have many worthy organizations asking for your support. You truly make a difference for the animals or our community when you support Talbot Humane. It is very true, when we each do our part, amazing things happen.